All of the neighbors are installing their own vinyl replacement windows, why can’t you? The best part is you can! (I mean really, they probably aren’t home improvement experts either!) My husband and I have successfully installed our own vinyl replacement windows and you can too. For our project, we chose Milgard windows because they are the cream of the crop. Not only do they reduce energy costs by trapping the hot air in during the winder and the cold air in during the summer but the come with a lifetime warranty. No other manufacturer offers this so our choice was easy. They were a little pricier than some other brands but we were able to find discounted windows and it’s a name we know we can trust. But let’s not get ahead of ourselves here. Before we even considered what windows to buy, we had to figure out how to measure the hole so we ordered the right window! 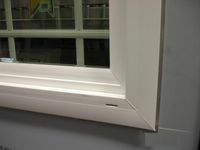 Vinyl replacement windows are very simple to measure for. The easiest thing to do is to leave the existing window frame in, however, when you replace the window it makes the actual window a bit smaller which in turn decreases incoming light and changes the size of yourwindow coverings. If you choose to leave the existing window frame in, that’s ok, it’s better if you don’t feel comfortable ripping out the whole window. To measure for this type of replacement, go from the edge of the window from and measure in 3 spots vertically and horizontally. (Just in case the window isn’t quite square and to make sure you have it done correctly.) Take these measurements to order your new vinyl replacement window. If you want to rip out the old window completely, including the frame, go ahead and take off any casing inside (if any) to measure the windows. Again, you need to measure 3 separate times going across the window, once in the middle and once on either side. Take the smallest of these measurements both vertically and horizontally and go order your window. When you place your order for your new vinyl replacement windows, be sure to get a new window with a flange on the outside. A flange is the strip that goes on the outside of the house to hide any old holes and trim area. For easiest installation (this does not require repair of stucco or wood outside) these are the windows to get. Other windows will cause you much grief and added expense. Break out your old window. It doesn’t really matter how you do it, you can try to salvage it or you can smash it out. Once you get all of the glass out, go ahead and use a Sawzall (a reciprocating saw) to cut out the frame running down the middle of the window. If you are taking out the entire frame, go ahead and unscrew any screws you find and take out the frame. You’re ready for your new vinyl replacement windows! From here, it’s so easy you won’t believe it. Pop the window in after caulking on the inside of the flange. Have one person hold the window in place while the other person screws it in to the frame. Make sure it’s level! Caulk where your new vinyl replacement window meets the window sill or fill the gap with a vinyl strip (you can order this with your windows) if you chose to leave your windows in. If you still have questions or aren't sure if you have the hang of it, check out this comprehensive window replacement guide. Does the value of your home increase if you install replacement window pricing Different styles of windows on the market today, each with their own unique attributes and features, will make replacement window pricing a learning event. Home improvement services will include replacement windows in your budget when figuring how much it will cost to upgrade your home. Have your window replacement projects installed in any month as long as your schedule and budget can allow it.